Find, Recover and Backup All Your Product Keys in Seconds. Free Trial! Find Your Lost Product Keys Instantly! Order Now | Try it For Free! 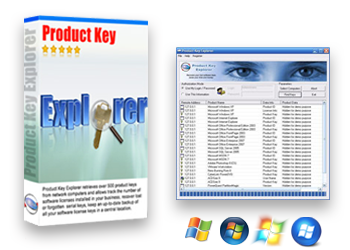 Product key Explorer recovers software license keys installed on your local or remote network computers, allows track the number of software licenses installed in your business. With Product Key Explorer you can scan local PC or network computers and recover +8000 software serial numbers.